Ever see a room and just feel instantly cozy, refreshed, calm or renewed? Or smell a scent that gives you comfort? These are the elements of design that add up to an environment that embraces the seasons. ' Embraces the seasons? '- You say...what does that mean? Every season has a feel and smell,and capturing that in your home can elevate your experience. I personally get giddy when it comes time to change my home's seasonal decor. It means there is a new beginning of sorts and an opportunity to change the atmosphere. How cozy does this mood board feel to you? If you already have these bold colors in place, then bravo!! You can put your seasonal spin on things by adding some soft texture and metallics. Seasons are often associated with colors, I want you to step back and look at it as a feeling instead. 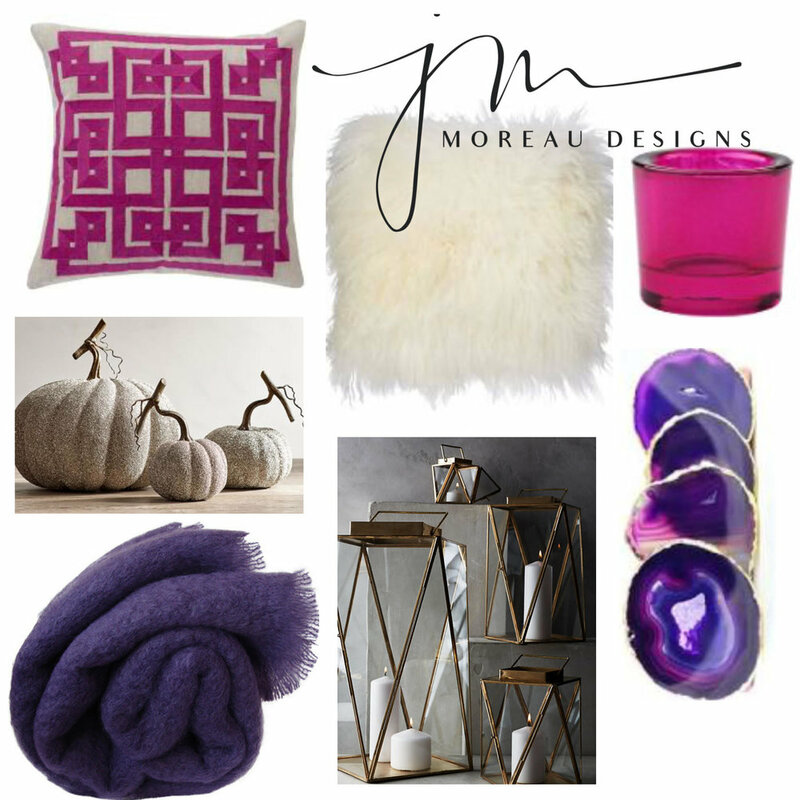 Fall evokes, cozy, warmth, texture, and deep rich colors in my mind. Matching existing decor shouldn't be a problem, stay within that color family and punch it up a bit. In the example above, I've used deep navy blue, burnt orange and gold. I could see purple, fuschia and gold as well being used for a more feminine vibe. 1) Texture-Mohair, faux fur/fur and velvet are cozy and inviting textures that evoke warmth for the upcoming cooler months. 2) Jewel Tones-Deeper, richer tones are enveloping and can harmonize with your existing decor. This is a play from the outside, where the leaves and flowers are deeper in color. 3) Metallics-An indirect interpretation of the golds, browns and oranges found in the leaves. It gives some sense of sophistication and warmth. 4) Scents-Candles, potpourri and stove top creations are wonderful accents. It lends a hand in creating the perfect atmosphere of comfort and sometimes nostalgia. If you happen to be in the part of the country where the season doesn't change, then having some of these rotating elements can help evoke the mood of Fall. Living in New England, I love the Fall, it gives me respite from the dry hot season and allows me to unwind and almost hibernate. My tastes change too in the kitchen, soups, breads and savory dishes take charge. I'm ready to put on a sweater, my long boots and grab a cup of pumpkin spice latte and sit on my deck, who wants to join me?